July opened with the release of a new website design. 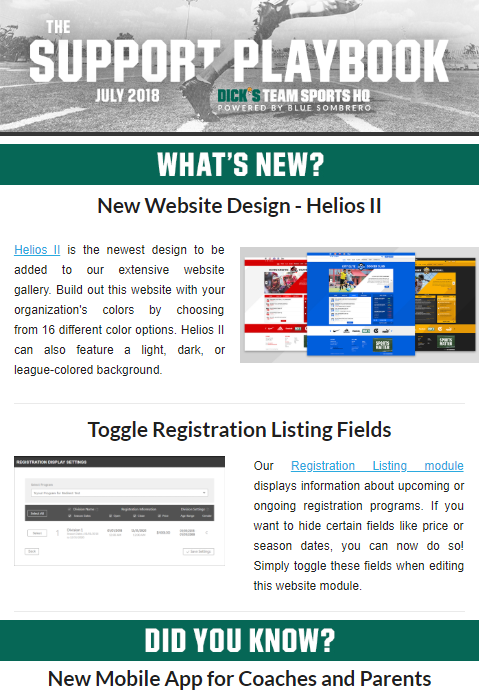 Helios II is now available across our wide array of colors. Rounding out the What’s New? section, our Registration Listing module can have information shown or hidden when being added to a page. Did You Know?, our new mobile app integration with GameChanger Team Manager is now live! This app is free for coaches and parents to download, and will sync posted roster and team information at the beginning of the season. Alongside the new mobile app, we updated our Team Page layout to coincide with GameChanger Team Manager. Need help getting started with the upcoming season? Don’t worry, in our Market Your League: 101 section, we provide a pre-season checklist so you don’t miss a step this fall!